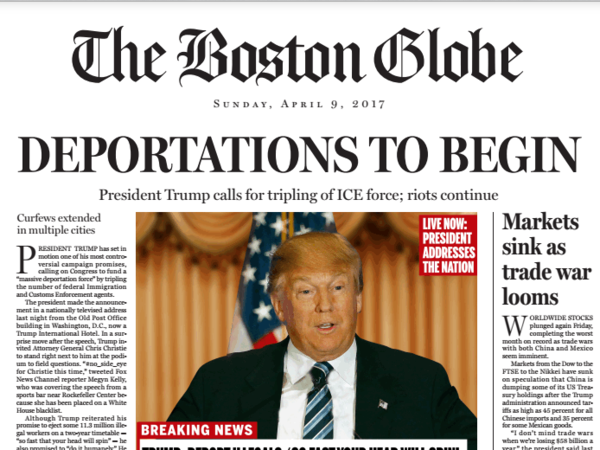 The Boston Globe's fake front page details what the editorial board believes would happen if Donald Trump becomes president. The opinion section of the Boston Globe is turning heads today. They've just published a fake front page from the future that details the kind of world a President Donald Trump would usher in. The news from April 9, 2017, includes fake stories about a market crash triggered by a trade war, the beginning of mass deportations and a story about the military refusing the orders of its civilian leadership. The paper accompanied what it calls a satirical front page with an opinion piece titled "The GOP must stop Trump." The editorial page writes: "[Trump's] vision of America promises to be as appalling in real life as it is in black and white on the page. It is a vision that demands an active and engaged opposition. It requires an opposition as focused on denying Trump the White House as the candidate is flippant and reckless about securing it." Weekend Edition Sunday spoke to Kathleen Kingsbury, the editor of the Globe's Ideas section, who said the paper wanted to take the GOP frontrunner at his word. She said they had some fun along the way, but they also reported this project out. They used Trump's tweets and his policy papers to inform the stories on the page. "His violent mix of intimidation, hostility to criticism and explicit scapegoating of minorities shows that there is a real political movement taking hold in America and that's a movement that we find deeply disturbing, one that we felt we needed to comment on," Kingsbury said. The Trump campaign has not yet commented on the front page.